Libratone Zipp (2015) review | What Hi-Fi? Even for us, we thought, it would be a tad uncouth anthropomorphosising a wireless speaker you can unzip. Besides, what impressed us so much about the original Libratone Zipp, which we awarded five stars three years ago, was not its colourful anorak but its performance. That’s how it became the company’s best-selling product to date and the one upon which it built its now rather heady reputation. The new Zipp works upon the same principle: an upright, cylindrical design, devised to output 360-degree sound. That’s serviced by an integrated digital Class D amplifier, feeding a claimed 100W into a 10cm woofer. The low end performance is tuned by a pair of similarly-sized passive radiators. Two 25mm tweeters take care of the highs and are aided by a 360º reflector to ensure wide dispersion. Input is more or less how you’d like – wi-fi, AirPlay, DLNA, Bluetooth, 3.5mm jack or USB – and the Zipp is willing to take on board high-res audio up to 24 bit/96kHz. If you don’t have your own digital music library, Libratone has added Spotify Connect and it’s also Apple Music ready. You can store up to five of your favourite Internet radio stations – all controlled via the Libratone app. Most impressive as far as the company is concerned, however, is their new SoundSpaces Link. It is essentially their take on multi-room, launched with the new Zipp and its sibling the Zipp Mini, but with nothing nailed down. 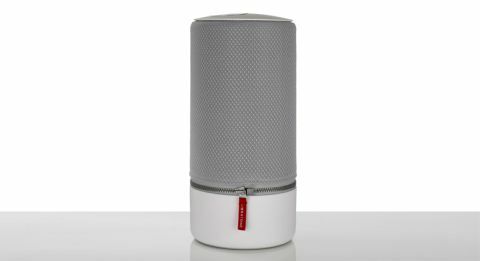 “Today’s consumers expect their sound to be ever-present, portable and flexible,” says Libratone CEO Jan McNair. “The new generation of Zipp lets you connect up to six speakers via wi-fi and place them anywhere, in any room, and move them around as you wish.” We agree; it’s a tidy concept. As you may have guessed, the Zipp is no longer furry. We’re sure for some people this will be a moment approaching that when Dylan went electric – admittedly, not exclusively people outside the What Hi-Fi? office – but we generally agree that the new mesh fabric makes the speaker look more sophisticated. And, Libratone claims, it helps the sound come through more cleanly. The rest is still plastic, which doesn’t make it feel as premium as some competitors, but at 1.8kg down to 1.5kg, it is even lighter and more portable than last time. And the touch-screen dial is nice to use, with a handy ‘hush’ feature, though we suppose most of the time you’ll be too far away to use it. Playing Andrew Bird’s Armchair Apocrypha album, the first thing we hear is how well the Zipp disperses the sound. This isn’t the loudest wireless speaker in this price bracket, but few spread the sound so well – the result of the 360-degree reflector working a charm. You’d still need more than one to stoke a party, but you really could position them almost anywhere. It’s a warm, full-bodied sound as well; the mid-heavy guitars and organ of opening number Fiery Crash are creamily smooth while the pizzicato strings of Imitosis are solid and steered well clear of sharpness. As ever, that body pays dividends with vocal, too: nudged slightly forward, Bird’s voice is strong and purposeful without sacrificing its laid-back charm. There’s a good amount of well-organised detail here. The beginning of Plasticities, for example, with its plucked violins, organ, electric guitar and glockenspiel, is rhythmically coherent and still feels as if there is space left to breathe. Changing tack with At The Drive-In’s Relationship Of Command album, the Zipp is quite capable of keeping up with the more energetic rhythms. But it does unearth some weaknesses. We’d like more drive, for a start. It’s not that the Zipp lacks feeling – it is satisfyingly expressive – but there is a slight loss of impetus and punch. That isn’t entirely helped by quite a narrow soundfield, either. It isn’t quite claustrophobic, but perhaps more tightly tucked in than we’d like. Parts you’d like to hear can get lost when textures become too congested – albeit the Zipp’s rhythmical sense and ability to bring melody to the front manage to keep its head above water. Undoubtedly, the new Zipp is a success; a worthy sequel that proves this concept has the legs to keep up with a market that has flourished as much as Libratone’s reputation over the past few years. It probably doesn’t stand out as much as its predecessor, given the ubiquity of wireless speakers at this price point, but its talents give Zipp the younger every chance of being as successful.